​​​​ LEWISVILLE – North Texas developer Bright Realty broke ground June 2018 on a $1.5 billion project called The Realm at Castle Hills. The 324-acre development is located in the master-planned Castle Hills community, west of US 121 and Josey Ln. Phase I of the project, named Offices at The Realm, will include a nine-story, 235,000-sf Class A office building with 15,000 sf of first-floor restaurant space. 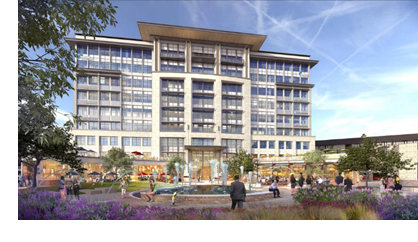 The company has also laid the groundwork for Phase II of the development—including a 260-unit multifamily complex and 35,000 sf of boutique-style retail space—which is expected to deliver in mid to late 2020. According to Bright Realty, The Realm is close to DFW International Airport, as well as major work hubs like Plano’s Legacy West. Additional plans for the project include condominiums, an amphitheater entertainment district, and additional retail, restaurant, multifamily properties.